Well, let's see what we've learned in the past few weeks. Comment: We're "helpers, not doers" according to the findings of the study. Awesome. Comment: I think this is an annual one and the most frequently replicated study in all of science. I've seen variations of it for 15 years, and I've learned two things: (1) the findings are always the same and (2) the role of women in doing service doesn't change. If you want to see more variations, check out any of these past posts (which have links). See also: lower course evaluations. Figure 1. 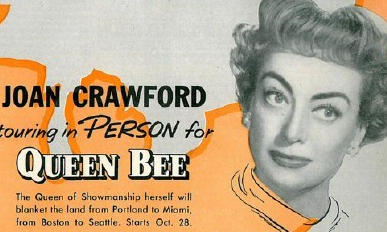 "Queen Bee" is a misogynistic red herring. "Across the three studies, we found consistent evidence that women reported higher levels of incivility from other women than their male counterparts," Gabriel said. "In other words, women are ruder to each other than they are to men, or than men are to women." Comment 1: Not to me, or at least they'd better not be. Comment 2: This is disheartening--or is it? Or are they interpreting as rudeness behaviors that they'd tolerate from men? Figure 2. Joan Fontaine in Born to be Bad. Comment 3: The study defines incivility as "low-intensity deviant behavior with ambiguous intent to harm," but that's always been true for a certain subset of both men and women, hasn't it? Christabel: "What a fine girl she is. So strong! So sensible! So capable!" Robert Ryan: "You ought to see her change a tire." He's calling her out on her passive-aggressive BS, but none of the other men see it for a second. So Christabel isn't rude, but she knows exactly what she's doing and the damage that she's causing. Who among us hasn't known a Christabel in academe? Anyway. Maybe there'll be some good news in the next set of studies.